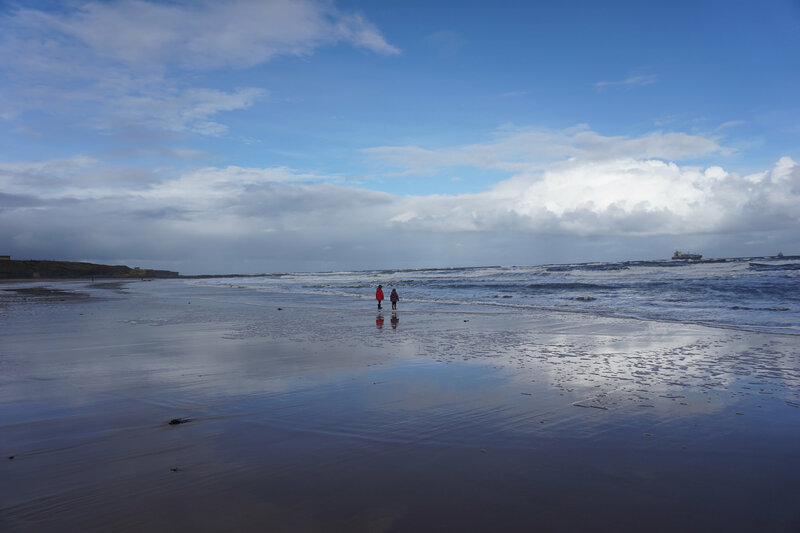 It’s Monday evening, and we’re back into the swing of things with school uniforms, home reading diaries and after school clubs – I’m already missing the half term break! I’ve had a lovely week off work on holiday with the kids – we’ve had such a wonderful time visiting friends and family, seeing some new sights and celebrating Sophie’s 4th birthday. Matt could only take a couple of days off, so I decided to take the children away on my own for a few days before he could join us so we could make the most of their school holiday. 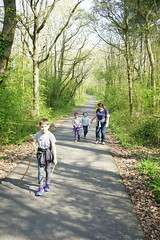 That seemed a great idea when I booked it, but as the trip grew nearer I began to wonder how sane I was to voluntarily take the kids away from home on my own without help – would we all still be talking to each other after the trip?! 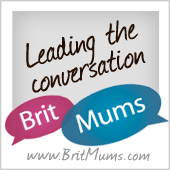 I needn’t have worried – it went really well and I loved spending time with them (although I was in bed very early every night as it was so exhausting!). 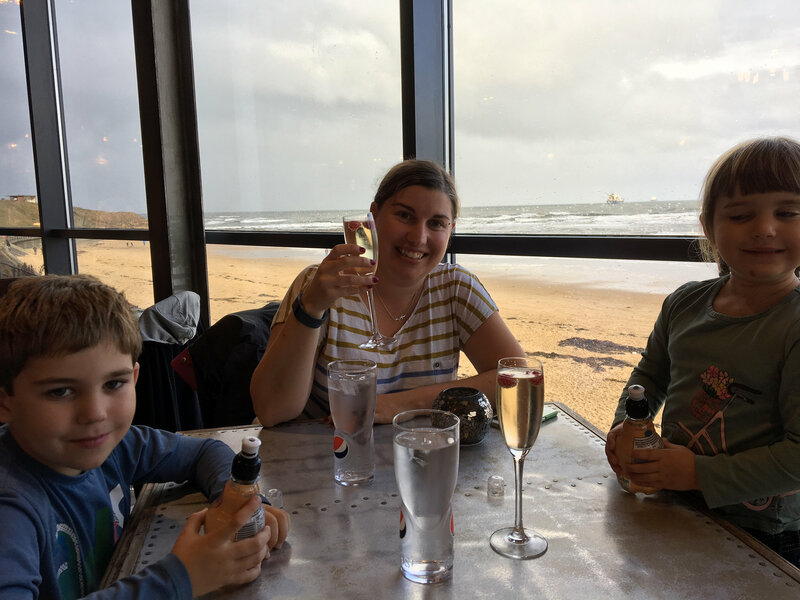 We’d decided to go to Edinburgh to visit my family and enjoy the city, but on the spur of the moment I decided to book a stopover in Newcastle to visit my friend Jo and to show the children where I go with work so frequently. So early on Sunday morning, we boarded our flight to the Toon for the first stage of our Northern adventure! The journey went brilliantly, and as soon as we dropped our bags at Jo’s house, we headed off on the metro to the coast for some fresh air! 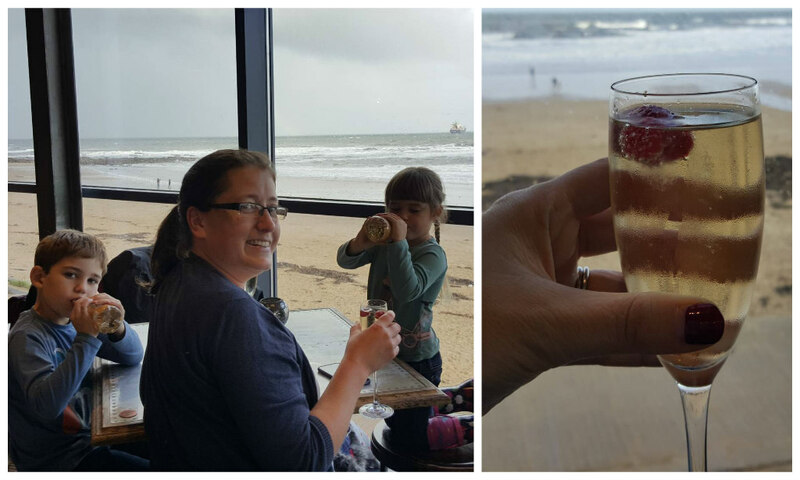 It was a little too fresh (and quite damp), so we took shelter in The View restaurant which had the most wonderful views of Tynemouth Longsands beach. We were soon enjoying fish and chips – and some bubbly to celebrate the beginning of the holidays! Best of all, the weather cleared during our lunch and we emerged from the restaurant to blue skies and a beautiful, quiet beach. 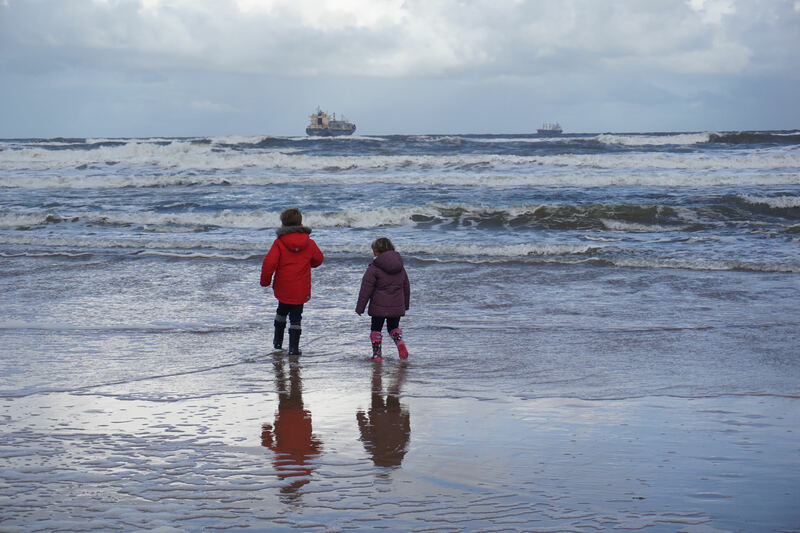 Alex and Sophie were thrilled to try out their new coats and wellies – and with the wind pretty bitter, they were certainly glad of the warm layers! They got straight to work running around on the beach and splashing around as close to the waves as they dared. 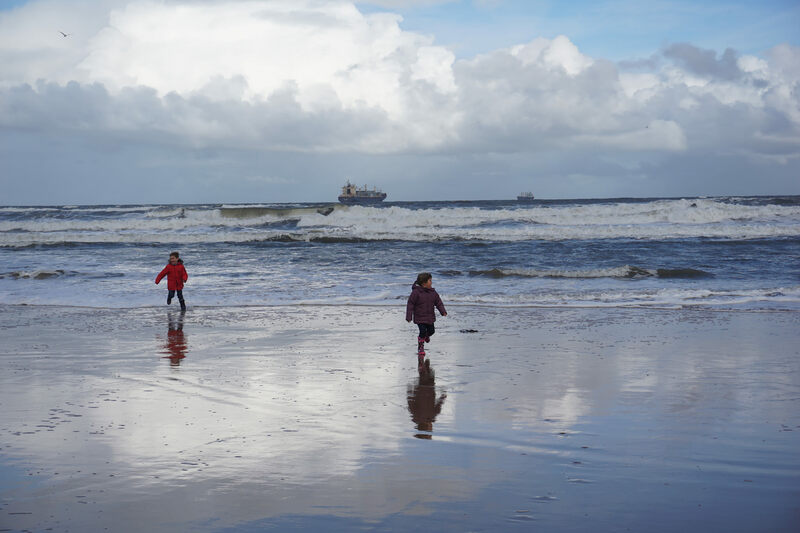 I loved how dramatic the North Sea looked – all wild and stormy with huge freighters on the horizon. They got pretty damp as the surf splashed over their wellies! 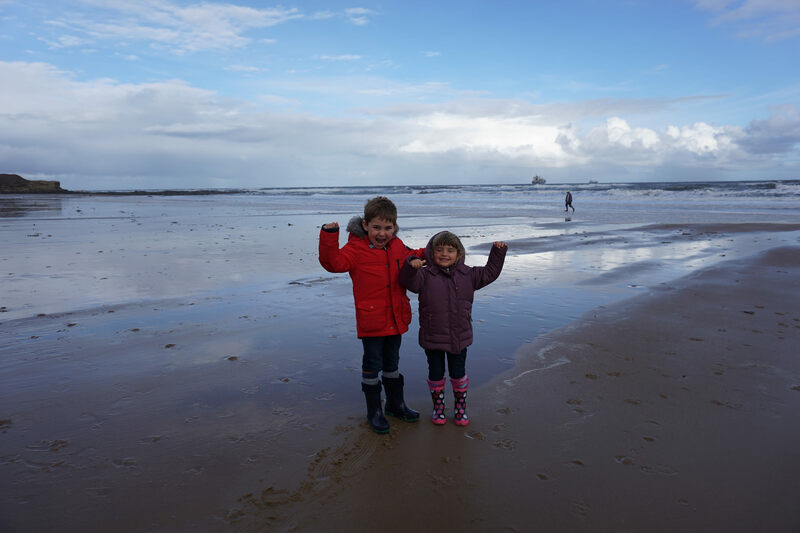 Look how expansive the beach was – Alex and Sophie look so mini against their environment! 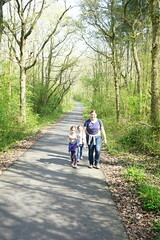 It was such a refreshing change from busy city life and exactly what I needed. Our beach trip took a comedic turn as we approached some rocks in the middle of the huge beach. 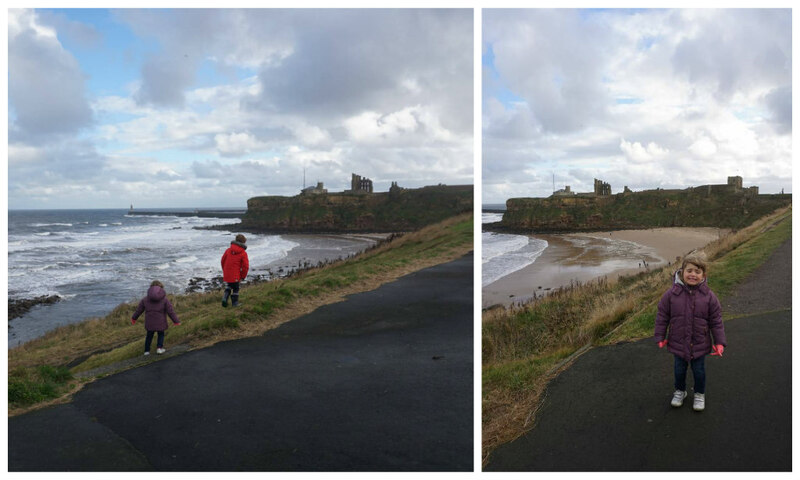 Alex and Sophie immediately started clambering across the rocks to peek in rockpools. I shouted at them to be careful of the slippery seaweed, and Sophie almost immediately slipped and slid quite gracefully into a rockpool. Except the rockpool in question wasn’t a little shallow one like all the rest, she gently slid down until the water reached over her waist! Jo and I both spent about a second contemplating taking a photograph of her – it was so unexpected and funny looking – but of course we raced over to haul her out and warm her up! We had a lunchtime train booked to Edinburgh, so we spent the morning close to Newcastle Central Station exploring the fabulous Life Centre. Part working medical and scientific research hub, and part public engagement visitor attraction, I’d wanted to visit for ages. And I wasn’t disappointed (although I do wish I’d been able to spend more time there to visit all the attractions!). 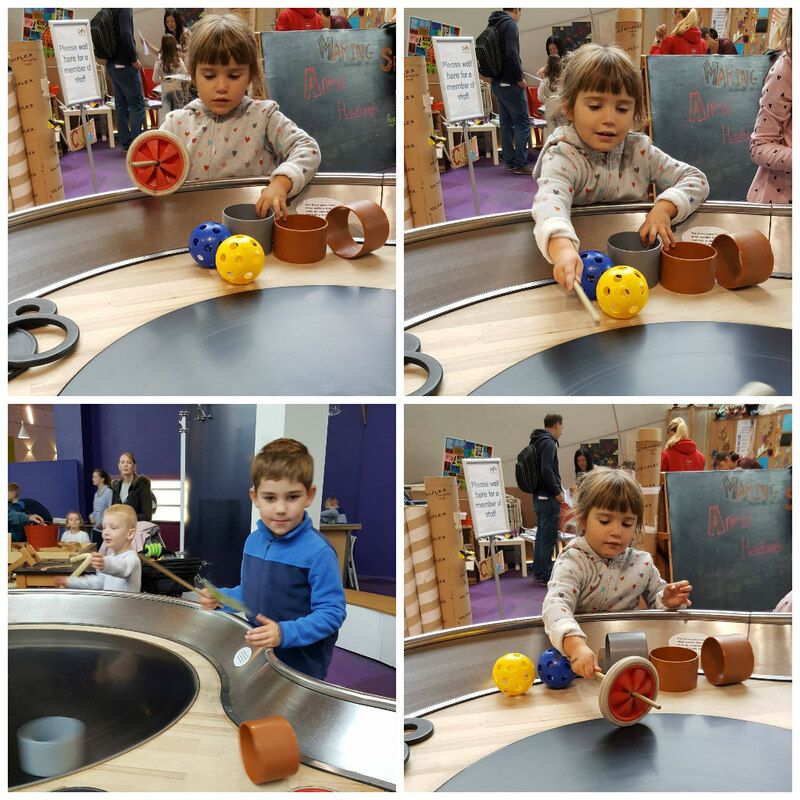 We spent most of our visit in the main Curiosity Zone where the children were immediately engrossed in the huge range of experiments and activities. 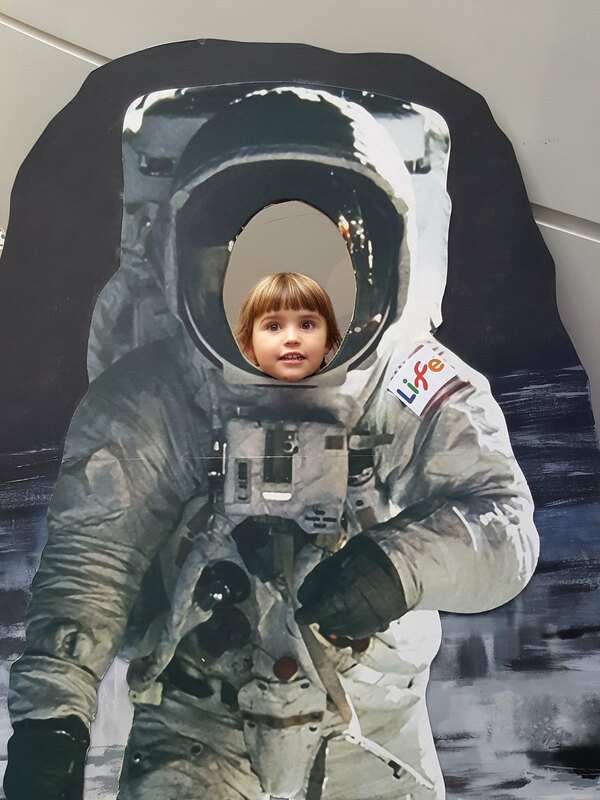 Sophie posed as an astronaut! Sophie made different shapes on an illuminated sand table, whilst Alex built complex tracks for a ball to follow on a magnetic wall! They played with thermal cameras, made a huge music box and wrote stories on the huge magnetic word wall. It was so impressive – we could’ve spent so much more time there. I’ll definitely be back. 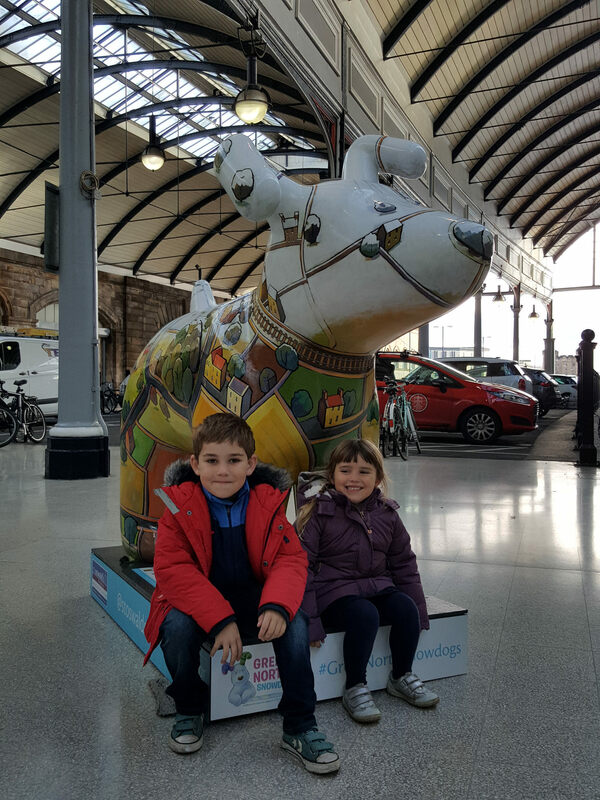 But we had a train to catch – so we just had time to spot a few Snow Dogs in the station before we found our platform. 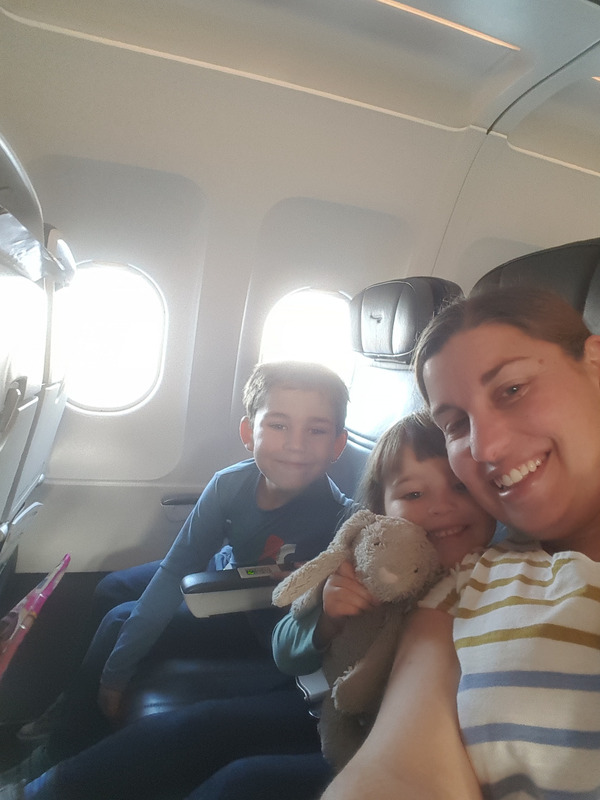 It was a flying visit to Newcastle – but it was absolutely worth the stop, and I’ll be bringing the family back as soon as I can! Oh you are a good Mummy, I’d have reached for the camera and then pulled her out! then again mine are much older, at 4 I’d have probably done as you did. You should be proud of yourself taking them on your own and having a lovely time. I think it always helps to have friends at the other end. The kids clearly didn’t share any of your concerns and were happy enjoying their mini break away. It must have been nippy up there, we had t shirt weather for half term in Cornwall, it has changed this week though, I’m even contemplating putting the heating on tomorrow if it doesn’t warm up! That medical research centre looks amazing, I love places like this, so great for inquisitive minds. I can just see both of yours twisting and turning every knob to see what happens. A lovely adventure. I’m looking forward to Edinburgh next.